A man is still in a “critical but stable” condition in hospital after a horrific crash which saw two heavy goods vehicles (HGVs) plough through the central reservation of the M62 in Calderdale. Police are still appealing for witnesses following the crash which happened westbound between junction 23 Outlane and junction 22 at Rishworth Moor at 2.30pm on April 29 and involved two red Volvo HGV cab units which were travelling in the same direction. 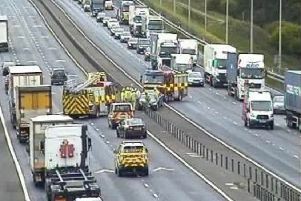 Initial enquiries suggest that one of the HGVs collided with the rear of the second vehicle, causing both to cross the central reservation and enter the eastbound carriageway. Any witnesses should call PC 6625 Pursey of the Western Area SRNSD on 101.